Pete Morton has the uncanny knack of sounding familiar yet different all at once. He'll introduce Dylanesque elements, then a touch of Richard Thompson, but all the way through there will be no mistaking his rich voice, his deceptively simple guitar accompaniment, his warm, deep arrangements, his fine song selection. You know where Morton has come from, the real pleasure is following him along his chosen path. His last album was basically a collection of traditional songs, but this time he plunges headlong into his own material; nine songs are written by Morton, one co-written with Bing Lyle, and one from the immortal Ben Jonson. He presents this with a compact ensemble; Morton's guitar and singing, along with fiddler Tom McConville and two members of the Welsh band, Fernhill: Julie Murphy, who provides some beautiful vocals, and Andy Cutting on accordion. 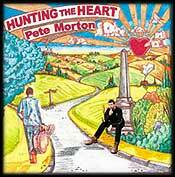 Morton is a story teller, whether describing his observations as he crosses the English countryside in the hypnotic title track or as he sits in his local pub("The Battle of Trafalgar"), he illustrates real people and real scenes, showing how life today relates to times gone by. Julie Murphy adds full-bodied accompaniments, at times blues-like, at times with the purity of a chorister, using unexpected harmonies that perfectly balance Morton's emotional voice. Although a strummed guitar is the main accompaniment, a weeping fiddle emphasizes a plea here, a dancing accordion sweeps you through a waltz there, promoting the voices to perfection. Pete's web page has CD and tour info.